Pine is a beautiful and majestic tree, particularly from Bialowieza. We can say that the highest pines in Poland grow in the Bialowieza Forest. Ages ago Bialowieza pines were obtained for masts of ships sailing around basins of the world at that time. The forest inhabitants used to form wild beehives in pines to get honey (very precious at that time). Even now in the forest there are several beehive pines though their number decreases year by year. In 2005 the most famous beehive pine of the National Park blew down. Its rotting tree stump was not able to bear the huge tree any more. Another famous pine with well-preserved wild beehive also withered a couple of years ago. At its base we can admire beehive's closing up(made from oak), which once shielded the wild beehive located on this pine at the height of several meters. In the forest you can also find pines with so called 'splint-hollows' (photo below) which is a place in the pine's trunk from which a forest beekeper was taking a splint. A burning splint was used to intoxicate bees during collecting honey from a wild beehive. A big pine with a huge hollow grows near forester's lodge 'Dziedzinka'. 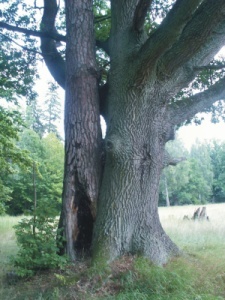 It is a very nice tree, and on the hollow you can see very well some marks made by an axe or other tool, which was used more than 100 years ago by a forest beekeeper who chipped away pieces of the pine's trunk.The Białowieża National Park is also famous for so called 'f. annulata' pines growing in the area. The origin of characteristic 'bark flange', which appears on a pine bark, is not clear. Some associate it with various sun exposure of which the result is heating up the bark of such a tree by the Sun but it is only one of many theories. 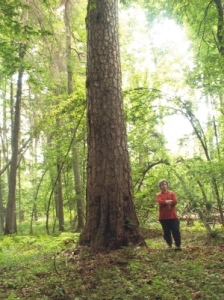 According to literature the highest Bialowieza pines reach 42-45 meters of height, and the trunk perimeter at the height of 130cm reaches 400cm, with the maximum age of 350-400 years. Observations & measurements taken by me confirm this information. A few years ago on my own I measured huge pines knocked down by a gale. One of them was 40.5 m high, and the other 41.5m. The thickest pine which perimeter I measured myself had 381cm in perimeter.